(Nanowerk News) It holds the record among small molecules in terms of the charge-carrier mobility of electrons in air. It enables a new manufacturing technique thus opening up a new field of work. And it has better properties under process conditions: The organic semiconductor developed in the lab of Professor Frank Würthner, head of the Department of Organic Chemistry II and head of the Center for Nanosystems Chemistry at the University of Würzburg. For the chemists among our readers: The material in question is dichloro naphthalene diimide substituted with fluoroalkyl chains. Unlike comparable substances, the organic semiconductor is easy to process under normal conditions and is extremely stable under environmental conditions. The Würzburg scientists have studied and modified the substance in cooperation with industry partner BASF for five years until it exhibited the desired properties. The online version of the journal Nature Communications now reports on the research results for which multiple patent applications have already been filed to protect its use on an industrial scale. The future is "plastic electronics"
Organic electronics have long found their way into the everyday life of many people, even though most who use the technology are unaware of it. Plenty commercially available products already integrate electronic circuits made up of conductive polymers or smaller organic compounds. For example, they make displays light up in different colours, they are at work in the air bag sensors of cars or generate electricity as flexible solar cell foils integrated in backpack flaps. And the product range is set to be expanded considerably in the near future: Luminous wallpapers that consume 50 percent less electricity than energy saving lamps, stick-on transparent solar cell foils, freshness sensor labels on meat packages, RFID chips that send detailed information about the location of individual products along the entire delivery chain: These are just a few examples of possible applications of the technology which is sometimes also referred to as "plastic electronics". To make the dreams of the industry come true, scientists worldwide are looking for new building blocks to create organic semiconductors. Their focus is on two properties in this context: Firstly, the materials must be powerful electricity conductors to work efficiently. Secondly, they have to be stable and functional for as long as possible. Compared to their conventional silicon-based counterparts, however, organic semiconductors are still having some difficulties here. The naphthalene diimide molecule is now turning the tide. The new semiconductor is the fruit of a long-term close collaboration involving the University of Würzburg's Department of Organic Chemistry II, BASF SE, Ludwigshafen and the Heidelberg-based InnovationLab GmbH. It was part of a research project funded by the Federal Ministry of Education and Research (BMBF) for five years: "Printed organic circuits and chips - Polytos". Within the scope of the excellence cluster "Forum Organic Electronics", the project aimed to "form strategic partnerships between scientific and industrial institutions in order to promote innovative development and economic success in Germany," as a BMBF paper puts it. The cluster brings together the know-how of globally operating companies, of the universities in Heidelberg and Karlsruhe and of numerous other partners to "make Germany a world leader in the development of organic electronics as the technology of the future". What makes the organic naphthalene diimide semiconductor discovered in Würzburg interesting for the industry: "This semiconductor can be produced and processed under ambient conditions. And what is more, it is stable when exposed to air," explains Dr. Matthias Stolte, team leader at Frank Würthner's department and co-author of the work published in Nature Communications ("Single-crystal field-effect transistors of new Cl2-NDI polymorph processed by sublimation in air"). Usually, organic semiconductors are either vacuum-processed or they are printed from a liquid solution comparable to an ink jet printer. These methods, however, are associated with disadvantages: High-vacuum processing is very costly, whereas the solvent-based method affects the quality of the semiconducting layer. The researchers from BASF and the University of Würzburg took a different approach: "We place the material on a substrate onto a hot plate heated to 180 degrees Celsius. Then, if you position a second substrate next to the first, the semiconductor will deposit there in a mono-crystalline layer," Stolte further. This makes production "extremely simple" according to the scientists. They believe that the material's excellent air stability and easy sublimation due to its low molecular weight are responsible for naphthalene diimide's favourable processability under normal room conditions. 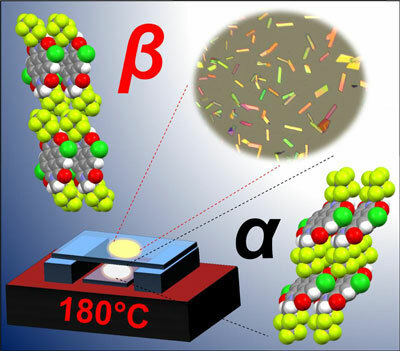 As the chemists successfully demonstrated, the use of the hot plate causes the molecules to arrange differently in the semiconductor – compared to the solvent-based approach. The method used so far results in the molecules forming a "herringbone" structure, whereas the hot plate deposition process yields a brick-wall pattern. The consequence: The charge transport is less influenced by the component's operating temperature – compared to similar molecules. This significantly enhances durability. The value is still seven times that of today's standard solar cells made of amorphous silicon. And the fluoroalkyl chains ensure that the naphthalene diimide molecule remains stable when exposed to air and water.